To get you started—whether you're on Windows, OS X, or Linux—author Jeroen Janssens introduces the Data Science Toolbox, an easy-to-install virtual environment packed with over 80 command-line tools. Discover why the command line is an agile, scalable, and extensible technology. 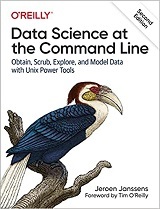 Even if you're already comfortable processing data with, say, Python or R, you’ll greatly improve your data science workflow by also leveraging the power of the command line. Jeroen Janssens is an assistant professor of data science at Tilburg University. As an independent consultant and trainer, he helps organizations making sense of their data. Previously, he was a data scientist at Elsevier in Amsterdam and startups YPlan and Visual Revenue in New York City. Jeroen holds an MSc in artificial intelligence from Maastricht University and a PhD in machine learning from Tilburg University. He's passionate about building open source tools for data science.